HomeBlogTED Course – Inspiring English conversation. Begin February 3rd 2016, 18:30. 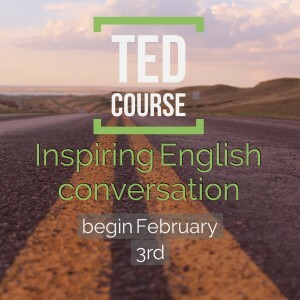 TED Course – Inspiring English conversation. Begin February 3rd 2016, 18:30. Join other critical thinkers in discussing interesting, inspiring topics from the website TED Ideas worth spreading (www.ted.com) . Enjoy a glass of prosecco, a comfortable atmosphere and practice expressing your opinion on current topics in English. Level: B2/C1. You should be able to speak flexible, spontaneous English but are looking to add new, current phrases and expressions to your vocabulary. Perfection is overrated; communicating your ideas well is the goal. Groups: 6-8 people. Form your own group with colleagues or friends or join in the next scheduled session. Price: 240.- Euro. Six weeks, 90 minutes per session. Contact me for registration per email or telephone. I’m looking forward to inspiring, inquisitive and lively conversation!